John Millet, Director VBPR UK (middle) receiving the EAGE Nigel Anstey Award 2018 from HRH Prince Joachim of Denmark (right) and Jean-Jacques Biteau (left), President of EAGE. Photo: Volcanic Basin Petroleum Research. 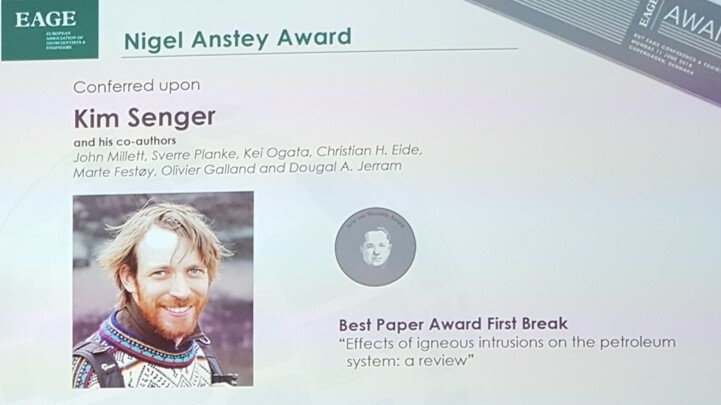 Congratulations to Kim Senger and co-authors for winning the European Association of Geoscientists & Engineers (EAGE) 2018 Nigel Anstey Award with the paper “Effects of igneous intrusions on the petroleum system: a review”, published in First Break Vol 35, No 6, June 2017. From 2012, the Nigel Anstey Award has been presented to the author(s) of the best paper published in First Break in the calendar year preceding the award. The Anstey award consists of a certificate and a specially bound copy of the issue in which the pertinent paper appears. This reallocation of the Anstey Award to a published paper continues the requirement that the contribution has a distinctly valuable and tangible bearing on one or more of the disciplines in our Association. Kim Senger (UNIS) was not present during the ceremony, so co-author John Millett (Volcanic Basin Petroleum Research/Univ. of Aberdeen) received the award on his behalf. Other co-authors of the paper were Sverre Planke (Volcanic Basin Petroleum Research/UiO), Kei Ogata (VU University Amsterdam), Christian Haug Eide (UiB), Marte Festøy (UiT), Olivier Galland (UiO), and Dougal A. Jerram (DougalEarth/UiO). Igneous intrusions feature in many sedimentary basins where hydrocarbon exploration and production is continuing. Due to distinct geophysical property contrasts with siliciclastic host rocks (e.g., higher Vp, density and resistivity than host rocks), intrusions can be easily delineated within data sets including seismic and CSEM profiles, provided igneous bodies are larger than the detection limit of the geophysical methods. On the other hand, igneous bodies affect geophysical imaging in volcanic basins. Recent analyses of 3D seismic data, supported by field observations and lab-based experiments, have provided valuable insights into the prevailing geometries of intrusions, i.e. (1) layerdiscordant dykes, (2) layer-parallel sills and (3) saucer-shaped intrusions. Where emplaced, intrusive bodies affect all five principal components of a given petroleum system: (1) Charge, (2) Migration, (3) Reservoir, (4) Trap and (5) Seal. Magmatic activity may positively or adversely affect any of these individual components, for instance by locally enhancing maturation within the thermal aureoles, typically 30-250% of the intrusion thickness, or by causing regional overmaturation. Site-specific evaluations, including the timing and duration of the magmatic event are needed to evaluate the overall effect of intrusions on a given sedimentary basin’s petroleum system, and these are highlighted by case studies from different volcanic basins. Kim Senger, first author of the First Break paper awarded the EAGE Nigel Anstey Award 2018. Photo: Volcanic Basin Petroleum Research.